WASHINGTON – The U.S. Department of Transportation’s National Highway Traffic Safety Administration (NHTSA) announced Nov. 18 it is calling for a national recall of vehicles with certain driver’s side frontal air bags made by Takata Corp. This decision is based on the agency’s evaluation of a recent driver’s side air bag failure in a vehicle outside the current regional recall area and its relationship to five previous driver’s side air bag ruptures, all of which are covered by existing regional recalls. “By demanding this national recall, NHTSA has demonstrated once again that it will follow data and evidence to protect the lives of Americans on the road and to hold manufacturers accountable,” said Secretary of Transportation Anthony Foxx. NHTSA contacted Takata and the vehicle manufacturers last week to call for the national recall of these vehicles after evaluating a recent incident that involved a failure in a driver’s side air bag inflator outside an area of high absolute humidity. Based on this new information, unless Takata and the manufacturers quickly agree to this recall, NHTSA will use the full extent of its statutory powers to ensure vehicles that use the same or similar air bag inflator are recalled. As part of these efforts and its ongoing investigation into both the defect and the scope of the recalls, the agency also issued a general order to Takata and all 10 of the vehicle manufacturers that use Takata air bag inflators – BMW, Chrysler, Ford, General Motors, Honda, Mazda, Mitsubishi, Nissan, Subaru, and Toyota – requiring each manufacturer to file, under oath, a detailed report and produce all related documents about completed, ongoing or planned testing of Takata inflators outside the current regional recall areas. The agency is demanding this information to compel Takata and the affected industry to be frank with not only NHTSA, but the American public, as to what testing and additional steps they have done and plan to do to control and mitigate the risk associated with Takata’s defective inflators. Additionally, NHTSA issued a special order to Takata, the second the agency has issued to the manufacturer regarding this defect, compelling it to provide, under oath, documents and detailed information on the propellant used in Takata’s inflators. In recent days, Takata has publicly conceded that it changed the chemical mix of its air bag inflator propellant in newly designed inflators. As part of its ongoing investigation, the agency will analyze the information received to determine if the chemical composition of Takata’s propellant mix may be a cause and/or contributing factor in the air bag inflator ruptures. In addition to the general order and special order, NHTSA is issuing a recall acknowledgement letter, a routine response to all safety recall reports filed with the agency. The letter summarizes the details of the most recent report submitted by Takata regarding its defective passenger side air bag inflators and identifies the information gaps the agency is insisting Takata clarify to ensure it provides the full information required by law. While NHTSA is not aware of either field incidents or test data suggesting that the problem affecting passenger-side air bags in the areas of persistently high humidity extends beyond those areas, the agency has been pushing the industry to perform testing to ensure that current recalls effectively cover vehicles with air bags that could be potentially affected by this defect. The information the agency receives from Takata and the auto manufacturers will provide further information and details needed to continue its investigation into this complex issue. Responses to the general order and special order are due to NHTSA by Dec. 5. Takata Chairman and CEO Shigehisa Takada said in a statement on Nov. 13, “Honda Motor Co., Ltd. today filed a recall notification in several countries, including Japan. This recall is due to a problem with driver seat airbags that were manufactured by our U.S. subsidiary, TK Holdings Inc. (Michigan, USA). “This recall is being conducted because an investigation into an accident that occurred in Malaysia in July 2014 found that the moisture absorption control of the gas generating agent in some driver seat airbags had not been correctly implemented at the time of manufacture, as a result of which an inflator canister may rupture when the airbag deploys. “We offer our deepest condolences for the victim who lost her life in the accident, and our sincere apologies for causing significant concerns and troubles to the users of our products, automobile manufacturer customers, shareholders, and any other stakeholders. “Takata will fully cooperate in carrying out this recall, and will devote all of our efforts to reinforcing the quality control system for our products and to preventing the recurrence of the problem. “Also, we will fully cooperate with the relevant authorities in responding to any inquiries or requests they might have. 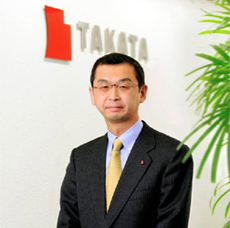 Headquartered in Tokyo, Takata is also known for manufacturing seat belts, steering wheels, interior trims, and child restraint systems.